Graphology, or psychology of handwriting, draws conclusions from the handwriting about the personality of the writer. The handwriting is considered as body language seen on a highly sensitive motoric level. As body language can be interpreted, graphology belongs to psychology of expression and/or diagnostic psychology. Graphology has been developed in Europe for about 100 years and is wide-spread throughout Germany, France, Belgium, The Netherlands and Switzerland. Being based on founded knowledge, its teaching is always up to date and applicable. Even a layman can distinguish between the unfinished writing of children, the handwriting of adults and handwritings of old, ill or addicted persons. Changes in the personality provoked by hypnosis, pills or resulting from psychotherapy will also be reflected in the handwriting. The most convincing proof of the fact that handwriting is basically a “brain writing“ and a centrally controlled process is the form of the writing that shows the same form independently from the executing organ (hand, mouth or foot). What is decisive is the psyche and not the executing organ. While it was Ludwig Klages who shaped graphology before WW2 in Germany and Crépieux-Jamin in France, it were the authors Müller and Enskat who after the war strongly influenced the further development of graphology as a scientific discipline. During the past 30 years graphology was increasingly based on depth psychology findings as represented by Freud, Jung and Szondi. The diagnostic view of graphology is even wider than that of many other diagnostic tests. Thus, graphology assumes a special place with respect to other psycho-diagnostic methods. The graphological view of a personality is extremely well suited as a framework into which tests, interviews and other methods can be integrated. Experience has shown that in tests carried out with job applicants, the candidates develop some form of “intelligent“ test conduct. Frequent participation in assessment centres result in a high learning success and the ability to judge test results. With a spontaneous handwriting sample, however, the writer is unaware of the handwriting which comes from his subconsciousness, thus showing most clearly his/her character. Changes in the handwriting from the writing learned at school, which create the individuality in handwriting, is not considered in most cases. Carries through a 3-years basic training in Munich and offers correspondence courses in German and English. 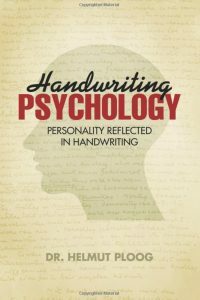 See also www.handwritingpsychology.com, browse on Amazon and read the reviews with regard to the new book: Handwriting Psychology. The book is also available in the iTunes Appstore.